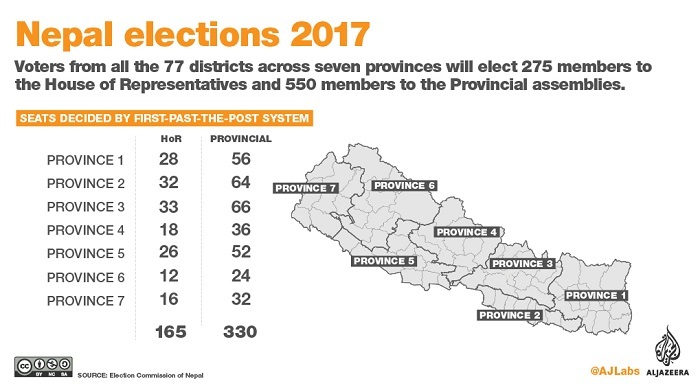 In the process of implementing the most controversial constitution promulgated on September 20, 2015, Nepal government completed local level elections for the 753 Village Councils/municipalities between May and September this year in three phases. Recently, it completed the first phase of provincial and parliamentary elections on November 26 and the next phase of elections are due on December 7. In the first phase of the parliamentary and provincial polls conducted in 32 districts on November 26, there were 37 seats for the federal parliament and 74 seats for provincial assemblies. The first phase of polling on November 26 was by and large peaceful though there were, according to media reports, nearly 100 minor incidents. According to the Election Commission, voter turnout was around 65 percent. The second phase of the elections on December 7, will cover 45 districts in which there are 128 federal parliament seats and 256 provincial seats. Of the 90 political parties registered with the Election Commission (EC), 48 parties are contesting elections for the federal parliament seats; while 53 parties are contesting elections for the provincial assemblies. In the 275-member House of Representatives, the Lower House of Parliament, 165 members will be elected on First-Past-The-Post (FPTP) basis; while 110 members will be elected on proportional representation (PR) basis. Similarly, in the Provincial assemblies, there are 550 seats in which 330 candidates will be elected on FPTP and 220 candidates on PR basis. Most importantly, women form 55 percent of the total federal and provincial PR candidates. 1 Political observers find this a welcome development in terms of enabling greater empowerment of women in the political process which no country in the region has been able to even aim for, much less achieve. The elections for the 59 member-National Assembly, the Upper House of Parliament, will be held indirectly by the chairpersons/deputy chairpersons, mayors/deputy mayors, provincial assembly members and federal parliament members after the completion of provincial and federal parliament elections. Table No. 1 indicates that Province No. 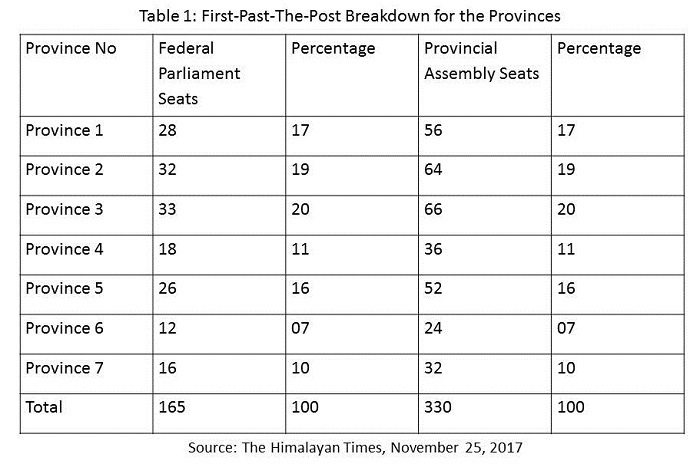 3 has the largest number of Federal Parliament/Provincial Assembly seats (20 percent); while Province No. 6 has the smallest number of seats (7 percent). Next to Province No. 3, Province No. 2 that has predominantly Madheshi population has 19 percent seats, followed by Province No. 1 (17 percent) seats, Province No. 5 (16 percent) seats, and Province No. 7 (10 percent) seats. However, nearly half of the total electorate out of 14 million, was excluded from exercising their voting rights in the local elections.3 Around five million Nepalese working in the Gulf and other parts of the world were debarred from voting in the elections. Also, excluded from voting were the 700,000 government employees in the country. This has been adversely commented upon by political observers as a serious lacuna in the election process that, to an extent, makes the exercise less representative in character. EC will have to eventually find a way out of this in the future. Significantly, a recent study shows that the elections in Nepal are eventually going to be the most costly affair in terms of money spent per elected candidate. During the local level polls, Rs. 5,000 was spent per voter in the country. This calculation is based on the figure that Rs. 69.42 billion was spent during the three phases of the elections in May, June and September 2017 in which the number of voters was 14.1 million.4 This includes all the expenditures made by the state, the candidates, the EC, the security agencies and different poll observer groups. Of the total expenditures made on the elections, 63 percent of the amount was spent by the candidates. Violation of the election cost of conduct has become a common affair. Most of the candidates contesting the elections for the local units, provincial and federal parliament have been spending money far beyond the limit fixed by the EC. There are also reports that the government has also violated the code of conduct as appointments, transfers and promotions for key positions were rampant in the wake of the elections. Amongst all the major political parties in the country, Madhesh-based Rashtriya Janata Party Nepal (RJPN) is only one that has raised the issue of rights for the deprived communities like the Madheshis, Tharus and Janajatis. 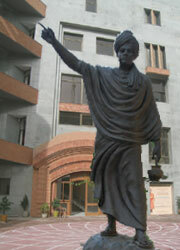 All other political parties, including the main players like the Nepali Congress (NC), Communist Party of Nepal–Unified Marxist-Leninist (CPN-UML) and Communist Party of Nepal-Maoist Centre (CPN-MC) have confined themselves to developmental issues, ignoring the aspirations of the rights-related issues of the deprived groups. On the issue of foreign relations, the ruling Nepali Congress Party leaders during their election campaign have been professing maintainance of balance in relations with India and China. However, leaders of the Left Alliance comprising the CPN-UML and the CPN-MC often projected anti-India and pro-China stand. 5 Both the CPN-UML and the CPN-MC want so-called unequal treaties with India such as the 1950 Treaty of Peace and Friendship to be abolished. However, the Madhesh-based RJPN is not in favour of any change in maintaining special relations with India. Anti-election activities by certain unidentified groups are being conducted on a large scale in the country. Cases of frequent clashes, particularly between the ‘left alliance’ and ‘democratic alliance’ forces during the political campaigns are common. 9 A number of senior leaders of both the left and democratic fronts have been targeted with bomb attacks both in the Terai and hill districts in which many people were injured. Because of such violent activities, many of the voters and also those involved in polls campaigns are scared. There had not been polls-related violence of such magnitude in the country in the past.10Therefore, the law enforcement agencies have been experiencing severe challenges to control the situation. Despite the inbuilt challenges in carrying out electoral exercise at such a massive scale in a country with little or no experience in participative democracy, the elections are likely to be completed in Nepal in a peaceful manner and within the given time frame. As such, there will be no major hurdle in the formation of a new government as mandated by the new constitution except in the likely event of the voters throwing up a bitterly fractured mandate. If that were to happen, Nepal will once again witness the familiar game of alliances and realignments leading to continued political instability as has been the case right from the time the first CA was formed and which continued in the second CA as well. However, a question of greater concern for the nascent democracy will be whether the election process will be able to sow seeds of strong and stable democracy in the country to make the process of people’s representation inclusive and equitable. Already a view prevails that the system chalked out does not adequately addresses the concerns of the deprived and marginalized sections of the population, including the Madheshis, Tharus and other Janajati groups, in regard to the formation of federals states, population-based elections, inclusivity and citizenship related issues are yet to be addressed in the constitution. This will have to be taken up by the governments that are formed in the aftermath of the completion of the electoral process. The issues that had been raised by different sections of the population after the promulgation of the new constitution should not be forgotten, even though the task of nation building, economic management, developmental activities and above all completing the task of relief and rehabilitation to the victims of the devastating earthquake of 2014 will assume primacy. 2. Post Report, “Women account for 55pc of total PR candidates,” The Kathmandu Post, Kathmandu: November 20, 2017. 3. Ghimire, Yubraj, “Next Door Nepal: Much ado about nothing,” The Indian Express, November 27, 2017. 4. Shrestha, Prithvi and Ghimire, Binod, “Elections becoming ‘unnaturally expensive,” The Kathmandu Post, November 18, 2017. 6. Pradhan, Tika R, “EC helpless against poll code violators: Ovservers,” The Kathamndu Post, Kathmandu: November 25, 2017. 8. Himalayan News Service, “Two European Union observers barred from monitoring polls,” The Himalayan Times, Kathmandu: November 25, 2017. 9. Post Report, “Parties clash in different districts ahead of polls,” The Kathmandu Post, Kathmandu: November 25, 2017. 10. Sedhai, Roshan, “With more attacks, anxiety over poll security grows,” My Republica, Kathmandu: November 19, 2017.